March 5, 2004: Global warming could plunge North America and Western Europe into a deep freeze, possibly within only a few decades. That's the paradoxical scenario gaining credibility among many climate scientists. The thawing of sea ice covering the Arctic could disturb or even halt large currents in the Atlantic Ocean. Without the vast heat that these ocean currents deliver--comparable to the power generation of a million nuclear power plants--Europe's average temperature would likely drop 5 to 10°C (9 to 18°F), and parts of eastern North America would be chilled somewhat less. Such a dip in temperature would be similar to global average temperatures toward the end of the last ice age roughly 20,000 years ago. Some scientists believe this shift in ocean currents could come surprisingly soon--within as little as 20 years, according to Robert Gagosian, president and director of the Woods Hole Oceanographic Institution. Others doubt it will happen at all. Even so, the Pentagon is taking notice. Andrew Marshall, a veteran Defense Department planner, recently released an unclassified report detailing how a shift in ocean currents in the near future could compromise national security. "It's difficult to predict what will happen," cautions Donald Cavalieri, a senior scientist at NASA's Goddard Space Flight Center, "because the Arctic and North Atlantic are very complex systems with many interactions between the land, the sea, and the atmosphere. But the facts do suggest that the changes we're seeing in the Arctic could potentially affect currents that warm Western Europe, and that's gotten a lot of people concerned." There are several satellites keeping an all-weather watch on ice cover in the Arctic. NASA's Aqua satellite, for instance, carries a Japanese-built sensor called the Advanced Microwave Scanning Radiometer-EOS ("AMSR-E" for short). Using microwaves, rather than visible light, AMSR-E can penetrate clouds and offer uninterrupted surveillance of the ice, even at night, explains Roy Spencer, the instrument's principal investigator at the Global Hydrology and Climate Center in Huntsville, Alabama. Other ice-watching satellites, operated by NASA, NOAA and the Dept. of Defense, use similar technology. The view from orbit clearly shows a long-term decline in the "perennial" Arctic sea ice (the part that remains frozen during the warm summer months). According to a 2002 paper by Josefino Comiso, a climate scientist at NASA's Goddard Space Flight Center, this year-round ice has been retreating since the beginning of the satellite record in 1978 at an average rate of 9% per decade. Studies looking at more recent data peg the rate at 14% per decade, suggesting that the decline of Arctic sea ice is accelerating. Some scientists worry that melting Arctic sea ice will dump enough freshwater into the North Atlantic to interfere with sea currents. Some freshwater would come from the ice-melt itself, but the main contributor would be increased rain and snow in the region. Retreating ice cover exposes more of the ocean surface, allowing more moisture to evaporate into the atmosphere and leading to more precipitation. Because saltwater is denser and heavier than freshwater, this "freshening" of the North Atlantic would make the surface layers more buoyant. 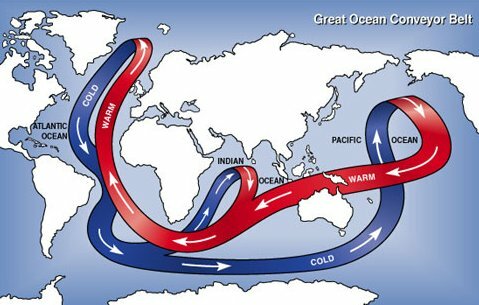 That's a problem because the surface water needs to sink to drive a primary ocean circulation pattern known as the "Great Ocean Conveyor." Sunken water flows south along the ocean floor toward the equator, while warm surface waters from tropical latitudes flow north to replace the water that sank, thus keeping the Conveyor slowly chugging along. An increase in freshwater could prevent this sinking of North Atlantic surface waters, slowing or stopping this circulation. AMSR-E is collecting new data that will help scientists evaluate this possibility. For one thing, it provides greatly improved ground resolution over previous all-weather sensors. AMSR-E images reveal smaller cracks and fissures in the ice as it breaks up in the spring. This detail allows scientists to better understand the dynamics of ice break-up, says Cavalieri, a member of the AMSR-E team. 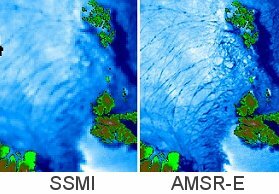 Right: Sea ice disintegrating off the coast of Greenland on March 15, 2003, as seen by the older Defense Meteorological Satellite Program SSMI sensor (14 km resolution) and the newer AMSR-E (~5 km resolution). Smaller cracks not visible in the left image show up clearly in the right one. "Other important pieces of the puzzle, like rainfall, sea-surface temperatures, and oceanic winds, are also detected by AMSR-E. Looking at those variables together should help scientists assess the likelihood of a change in the Atlantic currents," adds Spencer. Once considered incredible, the notion that climate can change rapidly is becoming respectable. In a 2003 report, Robert Gagosian cites "rapidly advancing evidence [from, e.g., tree rings and ice cores] that Earth's climate has shifted abruptly and dramatically in the past." For example, as the world warmed at the end of the last ice age about 13,000 years ago, melting ice sheets appear to have triggered a sudden halt in the Conveyor, throwing the world back into a 1,300 year period of ice-age-like conditions called the "Younger Dryas." Will it happen again? Researchers are scrambling to find out. On Feb. 13, an expedition set sail from Great Britain to place current-monitoring sensors in the Atlantic Ocean that will check the Gulf Stream for signs of slowing. The voyage is the latest step in a joint US / UK research project called Rapid Climate Change, which began in 2001. 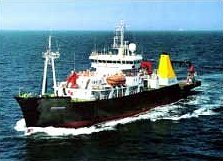 Another international project, called SEARCH (Study of Environmental Arctic CHange), kicked off in 2001 with the goal of more carefully assessing changes in Arctic sea ice thickness. Much depends on how fast the warming of the Arctic occurs, according to computer simulations by Thomas F. Stocker and Andreas Schmittner of the University of Bern. In their models, a faster warming could shut down the major Atlantic current completely, while a slower warming might only slow the current for a few centuries. And, inevitably, the discussion turns to people. Does human industry play a major role in warming the Arctic? Could we reverse the trend, if we wanted to? Not all scientists agree. Some argue that the changes occuring in the Arctic are consistent with large, slow natural cycles in ocean behavior that are known to science. Others see a greater human component. Aqua -- information about the AMSR-E sensor on NASA's Aqua satellite. Aqua is an international project supported by the United States, Japan and Brazil.